This was a winner's choice prize commission done for a kickstarter project. I haven't seen your art around a lot lately, Randy, but you still got it! wowowowow this is a great piece!! 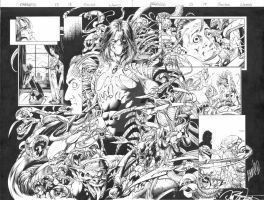 awesome darkness, I don't recall you drawing it very much apart from a couple of issues of witchblade. Those creature lurking around him are stunning concept. great! I don't think I've ever seen you draw Jackie before. Great classic Top Cow look. Mixing in some rougher lines looks good too.